Salwa Bugaighis. ar.wikimedia.org/Organisation Libya Future. Fair use. Occasionally you meet someone who embodies the hopes and aspirations of a country. The Libyan human rights lawyer Salwa Bugaighis, 50, seemed like such a person when I met her at the beginning of the Libyan revolution in 2011. Her murder inside her home in Libya's second city, Benghazi, on June 25th, has tipped many Libyans from depression into despair. 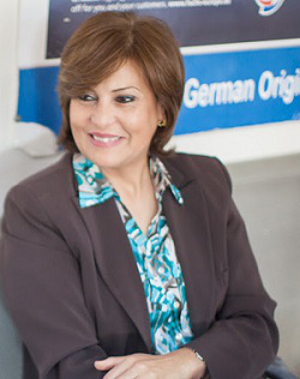 Salwa Bugaighis was the most prominent of the small group of lawyers who protested against Colonel Muammar Gaddafi's regime in front of Benghazi's north courthouse in February 2011. Taking their cue from the fall of President Mubarak next door in Egypt, other Libyans also took to the streets across the east of the country and so the revolution that toppled Gaddafi was born. Salwa and her sister, Iman, an orthodontist, were noticeable not simply because they were women, but also because they did not wear the headscarf. Salwa dressed modestly but with a slash of bright lipstick, a distinctive figure in the crowd. She and her husband, Issam, a psychologist, spoke English, and were happy to talk to the dozens of western journalists and human rights workers who rushed to eastern Libya. "You could feel the force field around her," said Sidney Kwiram who worked for Human Rights Watch in Benghazi in 2011. "She swept through the hallways, a mix of conviction and glamour." Salwa was determined that the revolution should not repeat the horrors of the Gaddafi regime. When revolutionary militiamen began rounding up African migrants, accusing them without evidence of being mercenaries for Gaddafi, she went directly to the prison and persuaded the self-appointed guards to set them free. Salwa had been building up to the revolution all her life. Her father, the anti-Gaddafi activist Saad Bugaighis, lived in exile in the USA for 30 years, so his daughters were brought up by their mother. It was a political family, where girls were encouraged to be more independent and westernised than most Benghazi women. As a law student in the 1980s, Salwa was suspended for a year from Garyounis University in Benghazi for opposing Gaddafi. It was a mild punishment. "I remember seeing bodies hanging in public," she told me. "They tried to frighten us all." When Seif al Gaddafi, the dictator's son, started a gradual process of liberalisation in 2004 Salwa and her fellow lawyers campaigned for political prisoners, including the families of those murdered in the notorious Abu Salim prison massacre of 1996. "Seif wanted to open the door just a little bit, so we went straight through," she said. From the beginning of the revolution, Salwa was determined that women should not be sidelined. As a member of the Transitional National Council, the body that ran eastern Libya, Salwa played a role in presenting the revolution to the outside world while Gaddafi's forces held onto Tripoli. She and Iman strongly backed the NATO air strikes that led to the overthrow of Gadaffi. "It will benefit the international community to support us," said Iman. "We will be a democratic country that respects minorities and human rights." Almost immediately after the fall of Gaddafi, that ideal began to crumble. Women were the first victims as male politicians jockeyed for power and Islamists tightened their grip on society. Salwa stepped down from the TNC. "Iman and I were very effective in the beginning but the men didn't believe that women could play a role at this time," she told me at the end of 2011 when I saw her in Tripoli. "They didn't think we had the strength, background or ability." She established a civil society protest camp in Benghazi, went on a monitoring mission to see the Tunisian elections, and campaigned against corruption and lack of transparency in Libya's increasingly chaotic politics. "Getting freedom doesn't mean reaching democracy," she said. Indeed it didn't. Militias, armed with weapons looted from Gadaffi's overstuffed armouries, fought each other, avenged old grievances, and preyed on the population while Libya's inexperienced politicians held futile meetings and passed decrees that everyone ignored. Salwa joined a committee to encourage national dialogue and considered running for office, but by 2012 violent jihadis were rampaging across eastern Libya. They assassinated scores of Gaddafi era military officers and, on September 11th 2012, the US Consul in Benghazi, Chris Stevens. Salwa marched with his picture at a protest against the killers - this was not the Libya she had fought for. Her husband, Issam, was elected onto Benghazi City Council but the couple received constant death threats from the jihadis who hated both democracy activists and women in public life. ("Democracy is blasphemy" read one slogan.) After a kidnap attempt on their son, Wael, they sent him and his two brothers to school in Jordan. As the situation deteriorated throughout 2013, they too spent months in the relative safety of Tripoli and out of the country. But Salwa and Issam could not bring themselves to abandon Libya entirely. "When we asked her if she had thought of leaving the country for some time, like many of her fellow countrymen and women, or whether she ever considered taking a back seat while things seemingly unravelled for the worse, she answered, “How can I do this? I was there from the beginning – this is what I believe in! I will continue until the end,” wrote her nieces, Lina and Rima. On June 25th, Libya held parliamentary elections. Less than half the eligible voters turned out - disillusion has set in as none of the elections in Libya since the revolution has produced an effective leadership or curbed the violence. Nonetheless, Salwa and Issam went back to Benghazi to vote. It was, to them, the reason they had sacrificed so much. Salwa posted on Facebook a picture of herself putting her ballot in the box and gave an interview to a local TV station. Maybe that was what alerted the gunmen that the couple were back in town. That evening, five armed masked men shot the guard at the gate to the compound and forced their way into the house. They shot Salwa in the head and stabbed her to death. Issam is still missing, believed kidnapped. God only knows what horrors he has been through, and whether we will ever know his fate. No-one, least of all Salwa, thought that Libya would leap from dictatorship to democracy overnight, but she - and we - hoped at least that a functioning state with some basic freedoms could be constructed from the ruin Gaddafi created. Looking back, it feels as if Salwa Bugaighis embodied not the hopes and aspirations of the majority of her country's people but a dream of revolution, shared by a minority of educated Libyans and nurtured by western journalists and democracy activists. We believed because we wanted to, but our hopes went against the historical tide. Those like Salwa who accelerate ahead of history must perish. After Salwa's death, a few dozen Libyans gathered in Tripoli's Algeria Square for what might have been a protest or a wake. On Facebook and Twitter they said that her death must not be in vain, and it was their duty to carry on her struggle. They are brave but it is hard to see them as anything but deluded. Libya is entering a dark age of jihadism and anarchy that may last for many years. Colonel Gadaffi left a vacuum where the state should be, now filled with violent men and Islamist fanatics. Across the Middle East, authoritarian regimes are reasserting themselves - witness Egypt and Syria - while weak states such as Iraq and Libya are falling prey to obscurantist, violent jihadis. This is a time in the history of the Middle East and North Africa that has no space for the values that Salwa Bugaighis represented. In October 2011, as I wandered round the rubble and burnt out buildings in Gadaffi's hometown of Sirte, after he was torn limb from limb by a mob of revolutionaries, I thought of Tacitus writing about the defeat of the Britons by the Romans: "They created a desolation and called it peace." Only in Libya today, after the death of Salwa Bugaighis, there is not even peace, just the desolation revolution has brought in its wake.